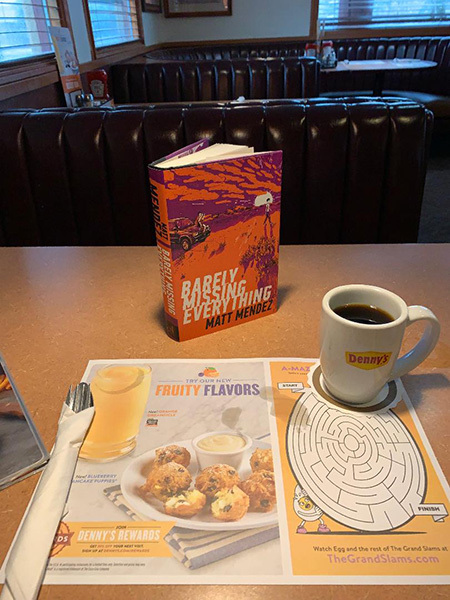 For a time, the novelist Matt Mendez had an office at Denny’s. Late at night, after his shift as an aircraft technician at the Air National Guard, he’d go to one on Tucson’s south side and write until two in the morning. Over cheese sticks and “gallons of terrible coffee,” he drew from his childhood in El Paso to write the story of two Chicano teenagers coming of age in the borderlands. In the world of table-top diners, Denny’s might be as American as it gets. Logically, Mendez’s debut young adult novel is, too. 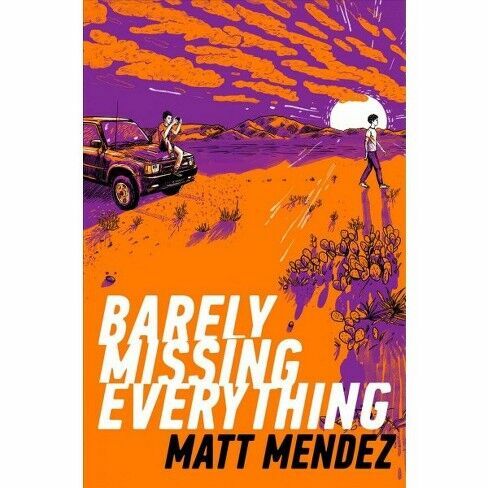 Set in El Paso, Barely Missing Everything (Atheneum 2019) follows Juan and JD along with Juan’s mother Fabi, as they navigate the circumstances of their lives. Juan is an aspiring basketball player and hopes for a scholarship to college. His best friend JD yearns to be a filmmaker and takes his camera everywhere. Fabi, who got pregnant as a teenager, tends bar and tries to be a good mother to Juan. The trouble starts when Juan and JD run when the police show up to a party on the outskirts of town. There was no real reason for them to run, just a split-section teenage choice that puts the plot—and the boys—in motion. From there, they run hard throughout the whole book—away from danger, towards their dreams, or into danger and away from their dreams. This language in the novel reflects that of real life. “Teen readers can spot a fake really quick,” he says. So there is plenty of Spanglish and plenty of swearing. “I want readers to be absorbed by the story. Otherwise I’d be writing an afterschool special. If you’re just trying to give a message, you’re not in the real storytelling world,” Mendez says. Mendez also wanted to portray El Paso authentically, in present day, which meant capturing changes happening in the urban landscape. The young protagonists live in the central historic district of the city, a working-class neighborhood in flux. “There are people trying to ‘hipster it up’ and the boys don’t know if they’ll be priced out or not,” he says. “But it’s home to them and they’re really out of sorts when they’re not in that part of town. Later, the boys cruise Glory Road near the University of Texas at El Paso, where JD observes “the short street crawling with nerdy dudes wearing skinny jeans, a sea of beards and glasses,” and feels both contempt and envy for the college hipster life. Juan’s mother Fabi works at a bar in Five Points, where the clientele has gone from “gente form Juarez, crowds of displaced men and women who’d come to escape the drug war horror show” to the “hipster crowd, who liked to ironically enjoy the dumb tropical themed décor and cheap beer.” The hipsters seem to view Fabi, and her problematic boyfriend, as part of the quaint décor also. Mendez wrote the inmate a letter, and they corresponded before the inmate was executed. There’s a death row inmate in the novel, and in earlier drafts, he played a more central role, Mendez says. Over time, the book became more focused on the two boys, and one of their mothers. But the idea of how two lives can unfold so differently–depending on circumstances, choices, and conditioning–stayed with him. 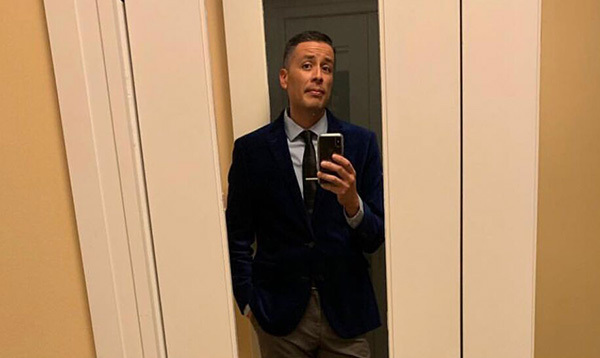 He also got help from instructors and staff at Pima Community college, where he took creative writing classes and discovered Chicano, Latino, and Latin American writers. “I hadn’t read any Chicano writers ever. Sandra Cisneros’ The House on Mango Street was everything. I wish I’d had that when I was young,” Mendez says. He also read Dagoberto Gilb, who lived in El Paso and began his writing career there, and the Uruguayan writer Eduardo Galeano, among others. Mendez later transferred to the University of Arizona and minored in creative writing to support his screenwriting efforts. After he earned a BA, his professors encouraged him to continue on for an MFA in creative writing, which he did, only to find himself a fish out of water. “It was a serious line of inquiry. I was like, um, of course they have to be Mexican, that’s my world,” he says. Which is important, Mendez says, because young writers—and youth everywhere—need role models who understand who they are and where they came from. Mendez’s book came out the same day federal prosecutors charged 50 people—including several Hollywood stars—with influencing college admissions decisions, paying off and bribing officials to guarantee a spot for children at the schools. The news made him reflect on his characters. In the book, Juan’s mother Fabi misses her chance to go to college because when she is still in high school her mother dies quickly of cancer with no health insurance. If Fabi had been a little older or had more guidance, Mendez says, she might have been able to go college. The loss of her mother didn’t have to mean losing out on her education too. Look. Before I got drafted and went to Vietnam, before they shot me in the head and left me for crazy, I was gonna be an engineer. I had the best grades in school. The best! But I didn’t know I needed to apply to the university before going. To be accepted first. ¿Me entiendes? I thought I could just show up, fill out some papers, and go inside. Nobody ever told me how it was supposed to go.